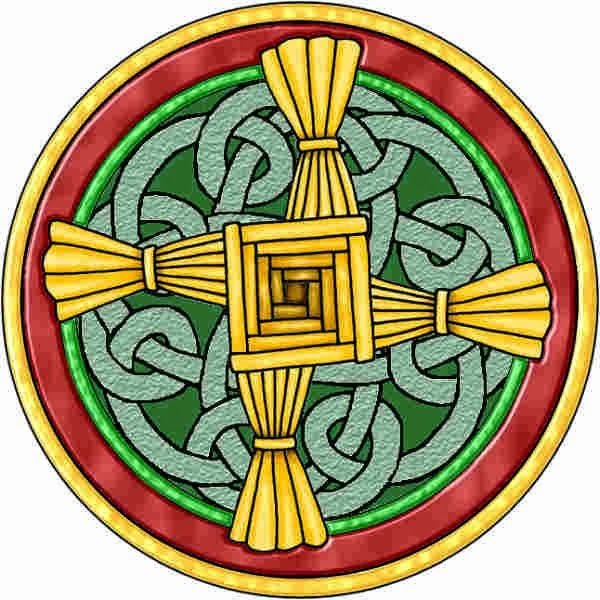 We celebrate the feast of St. Brigid of Kildare, 5th century Irish saint, on February 1. Our family has had chickens almost two years now and I really enjoy having the fresh eggs readily available in our kitchen. I recently learned that St. Brigid, in addition to being a patron of Ireland, is also the patron of poultry farmers. So as "poultry farmers" I thought it would be nice to find an egg dish to celebrate our patron's feast day and found this great recipe chock full of Irish ingredients - Guinness, potato, kale, Irish cheddar. The Guinness caramelized onions add a tasty zing to this egg abundant dish. Great for a breakfast or brunch on her feast day or that of other Irish saints. Pre-heat oven to 350 degrees. 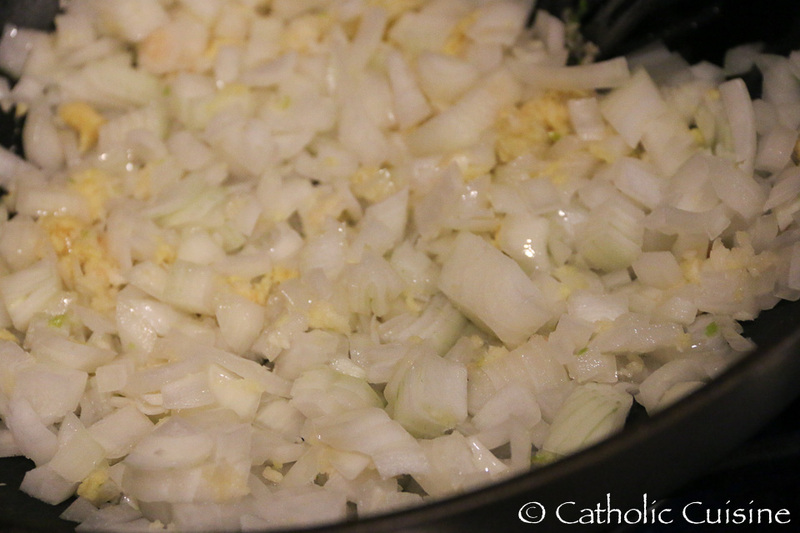 Saute onions over medium heat in olive oil and cook until tender, about 5-7 minutes. Pour Guinness into the pan, stir and cover. Let cook for 15 minutes until liquid is absorbed. Place diced potatoes in another greased pan, and cook over medium-low heat for 15 minutes. In bowl, beat eggs then add milk and mix. Add cheese, onions, potatoes, spinach (& kale optional), salt and pepper. Mix together and pour into greased round baking dish or quiche pan. Bake uncovered for 35 minutes, or until the top is golden brown. St. Brigid, Pray for us! I was looking for a lamb dish to make on the feast of St. Agnes and came across this cute idea for mini pot pies. 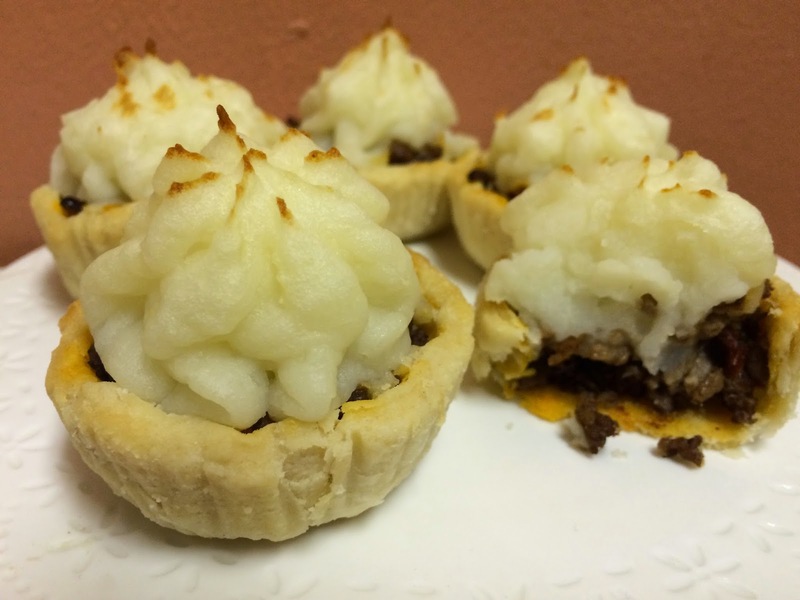 Combining tender lamb with sun-dried tomatoes in a mini pastry crust and topping with mashed potato icing makes pretty “cupcake” looking pot pies. On January 21 we celebrate the feast of St. Agnes, 4th century martyr, known for her consecrated virginity. She is often depicted holding a lamb as her name, Agnes, means lamb or victim in Latin, and pure in Greek. In Rome on this feast day, two lambs are placed on the altar of the Basilica where her relics lie and are then blessed. The wool from these lambs is used in making the pallium, the symbols archbishops wear as sign of their authority. These are given to the new archbishops on the Feast of Sts. Peter and Paul, June 29. The small lambs, traditionally less than a year old, are carried to the Pope in baskets, as per tradition, by the Canons Regular of the Cathedral of St John Lateran. To symbolize St. Agnes’ purity, one of the lambs wears a crown of white flowers, while the other wears a red floral wreath to recall her faithful witness even unto death. Reared by religious sisters in the Saint Lawrence convent in Panisperna, Rome, come Summer these same lambs will be brought to the Saint Cecilia convent in Trastevere. There, in a custom that has remained in tact down through the centuries, they will be shorn to supply the wool from which the religious sisters will weave the Pallium. 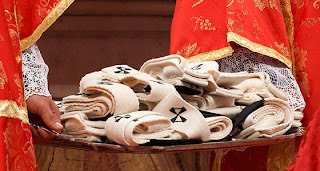 The Pallium are white woolen stoles, decorated with six black crosses worn by metropolitan archbishops around their necks as a symbol of their authority and unity with the Pope. Once woven they are custodied in an urn at the tomb of St Peter until the Holy Father presents them to newly-appointed metropolitan archbishops on June 29, the feast of Sts. Peter and Paul. With the connection of lamb's wool, St. Agnes feast day lends itself to anything fluffy and white. Whipped cream seemed a fun way to try to replicate the look of wool and with this mid-winter feast, a perfect topping for a warm drink. It's easy too! Whether it be hot chocolate, chia latte, or a cappuccino, make it St. Agnes festive with a "woolly" topping. And if you are looking for some specific drink recipes with woolly names here are a few that would be fitting as well. Lamb's Wool - a type of Wassail ale dating from medieval times, traditionally served on Twelfth Night celebrating the end of the Christmas season. It is so named as the frothy apple mixture resembles wool. It would make a fun drink for St. Agnes feast celebrating as well. 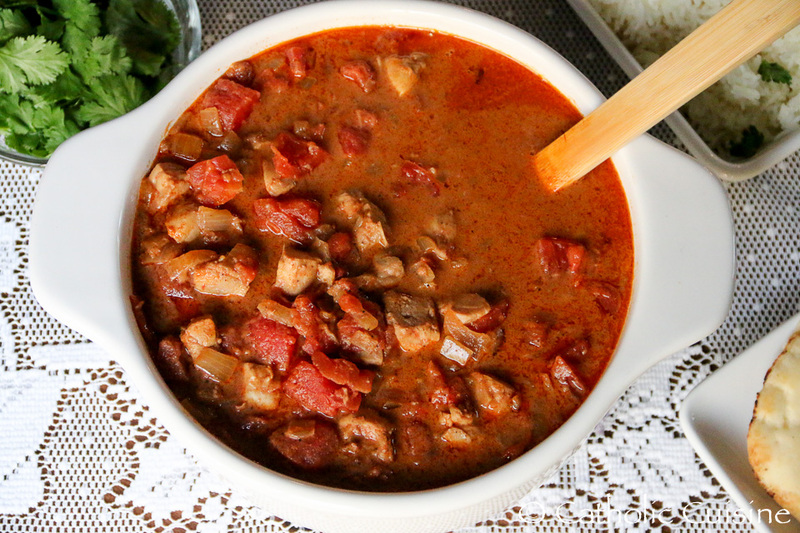 Florence Berger has a recipe for Lamb's Wool in her Cooking for Christ cookbook. There are other versions of this wool-named ale including this one from Miss Foodwise blog. Can be made as either an alcoholic or non-alcoholic drink. Warm Wooly Sheep - a sweet, creamy, warm drink for the grown ups. It is made from Scotch, Drambuie, and warm milk. Recipes abound on various mixed drink websites. Legend says that the pious daughter of a rich merchant asked him to bring her a portrait of Our Lady of Altagracia from Santo Domingo, but no one had heard of that title. The merchant, staying overnight at a friend's house in Higuey, described his problem as they sat outdoors after dinner. An old man with a long beard, who just happened to be passing by, pulled a rolled up painting from his bindle, gave it to the merchant, and said, "This is what you are looking for." It was the Virgin of Altagracia. They gave the old man a place to stay for the night, but by dawn he was gone, not to be seen again. The merchant placed the image on their mantle, but it repeatedly disappeared only to be found outside. They finally returned it to the church. In the picture book, A Gift of Gracias, by Julie Lavarez, a connection is made between this special feast day and oranges. These Orange Carrot Cookies would be a delightful treat for the Feast of Our Lady of Altagracia, coming up on January 21st, especially paired with a reading of the book. You can find the original recipe over at Dawn's blog, By Sun and Candlelight. I made a few changes that I will post here. Just FYI, these are soft, almost muffin-top like cookies, not crispy or crunchy cookies. Preheat oven to 350 degrees. Combine baking powder and flour and set aside. Cream the egg, butter, sugar and vanilla. Add carrots and zest and mix well. Slowly incorporate flour mixture being careful not to over mix. Drop by tablespoons onto parchment covered cookie sheets. Add sugar sprinkles if desired. Bake 10-12 minutes. Remove from oven and let cookies cool on a wire rack. Belgium is famous for its waffles. So if you are looking at celebrating a feast with a Belgian connection, look no further than the glorious waffle. I have some family members who are currently very excited about waffles and wanting real Belgian style. I did some research and found that there are two primary distinct styles of waffles in Belgium and both are different from the Americanized version most of us are familiar with. Even the name "Belgian waffle" came from the 1964 Worlds Fair in New York. There is the gaufres de Liege (Liege waffle) and the gaufres de Bruxelles (Brussels waffle) - gaufres is French, wafel is Dutch. Some history of the Belgian waffles can be found here, here and here. Both are distinguished from the Americanized version by a yeast batter with a delicious amount of butter. Liege waffles are made with a thick, sticky batter with added vanilla and large sugar crystals called pearl sugar. When the waffles cook in the iron, the sugar crystals melt and caramelize on the surface, contributing to a crunchy sweetness. They also have uneven edges. These are the common waffles sold by street vendors in Belgium. Brussels waffles were made with a thinner batter which makes them lighter and crisper with smooth edges. These are closer to the American version. So I splurged on a new Belgian waffle maker and some pearl sugar with Christmas money we got and put it to work to recognize the feast of Our Lady of Banneux, January 15. This commemorates the apparitions of Mary to a young girl, Mariette Beco, between January 15 and March 2, 1933 in the town of Banneux, which happens to be in the province of Liege in Belgium. It was very similar to a series of apparitions to five young children in nearby Beauraing from November 1932 to January 1933. Both were investigated and approved by the Church in 1949. Mix yeast, granulated sugar, salt and water. Let stand 15 minutes for yeast to activate. In mixing bowl mound the flour and make well in middle. Pour yeast mixture into well and mix, adding eggs and melted butter. Mix until blended. Batter will be thick and sticky. Cover dough and let rise in warm spot 30-60 minutes to double. After rising add half cup of pearl sugar and mix in. Spoon onto hot, greased waffle iron. Cook until golden - time depending on temperature and temperament of your particular waffle iron. Behold, wise men from the East came to Jerusalem, saying, "Where is he who has been born king of the Jews? For we have seen his star in the East, and have come to worship him." January 6th is the traditional feast of Epiphany! 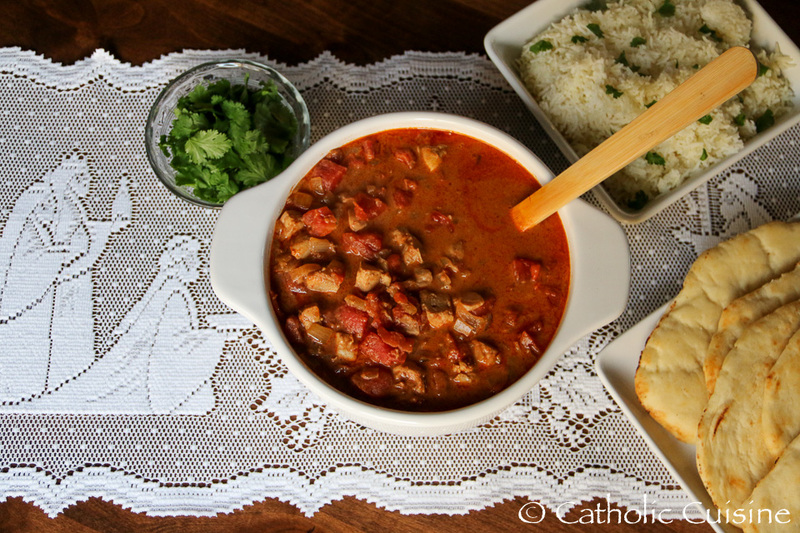 To celebrate I decide to serve an Eastern dinner of Chicken Tikka Masala, Basmati Rice with Fresh Cilantro, and Naan recalling the "wise men from the East!" This was the first time I've made Chicken Tikka Masala and I most definitely will not be waiting another year to make it again. It turned out amazing! 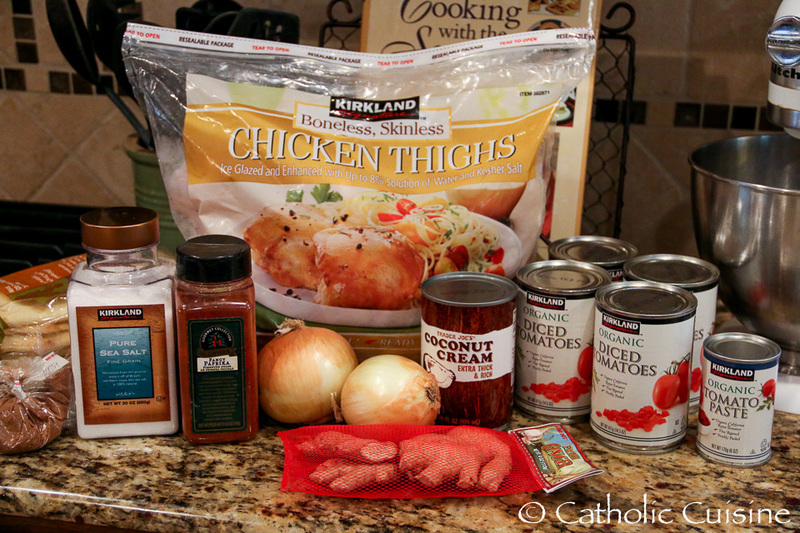 Cut the chicken thighs into bite-sized pieces and transfer them to a 6-quart slow cooker. Sauté the onions and garlic in a skillet with a little coconut oil over medium-high until softened, then stir in the tomato paste, grated ginger, paprika, salt, and 2 tablespoons of garam masala until fragrant. 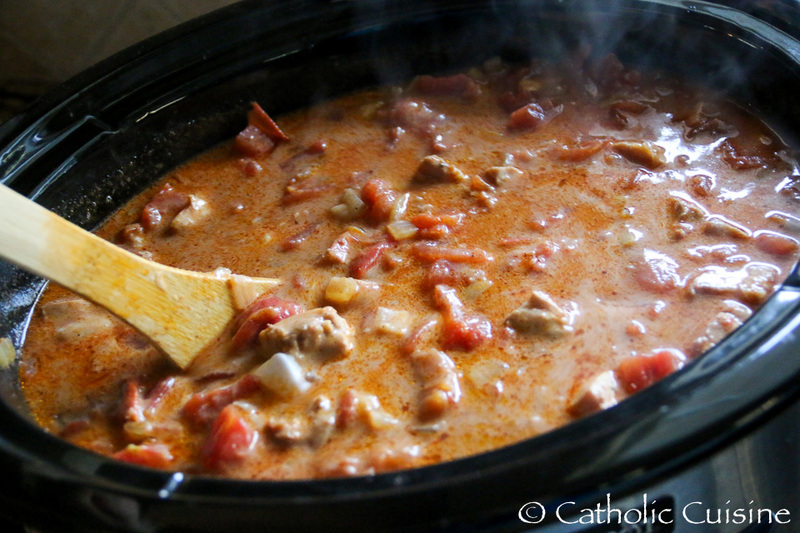 Transfer to the slow cooker. 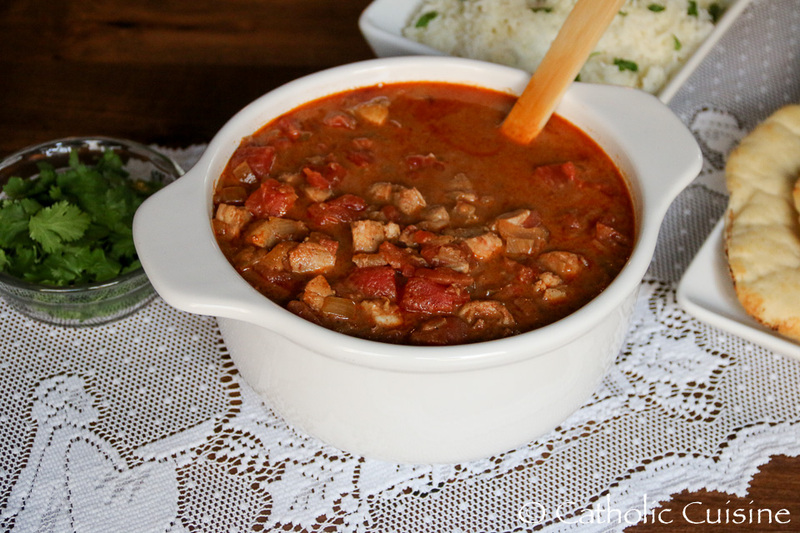 Stir in the diced tomatoes (with their juices) and mix until the chicken is evenly covered with spices. 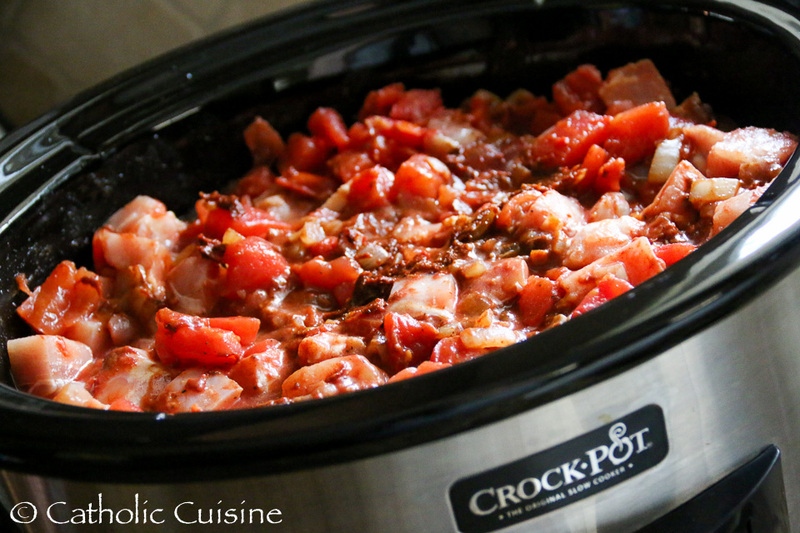 Cover the slow cooker and cook for 4 hours on high or 8 hours on low. Fifteen minutes before the end of cooking, stir in the coconut milk. 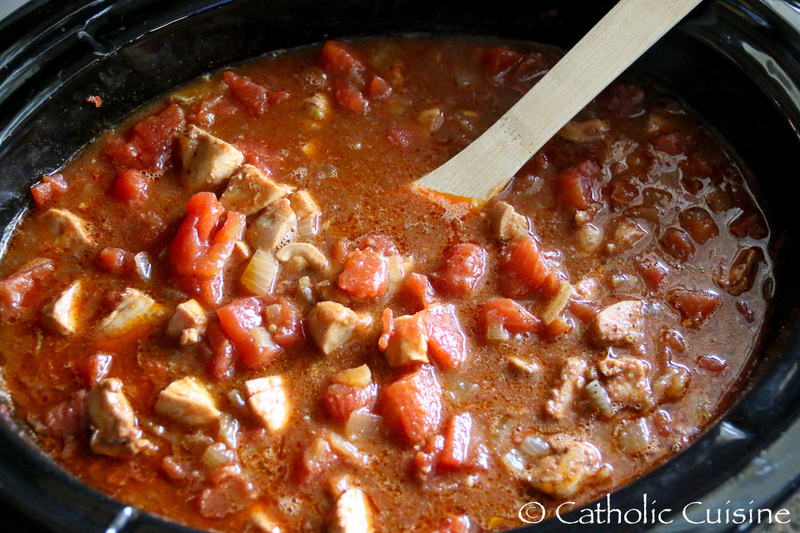 If you prefer a thicker sauce, leave the slow cooker uncovered for the last 15 minutes. Taste and add more garam masala or salt if needed. Serve over rice with fresh cilantro sprinkled over the top of each serving. Note: The Chicken Tikka Masala can be refrigerated for 3 to 4 days or frozen for 3 to 4 months. The beautiful Silent Night Table Runner can be found here. The wise men were guided to the baby Jesus by following the star they saw in the East, so the five-pointed or Epiphany star is a common symbol of the feast. 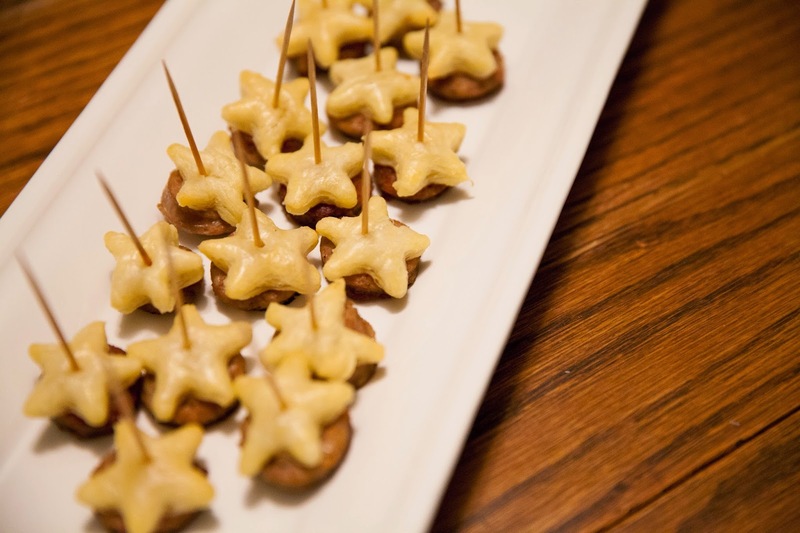 Let these fun, and simple to prepare, sausage and puff pastry appetizers guide the way for a fun Epiphany treat to celebrate the day. Cut the sausage links into 36 slices, approx. 3/8 inch. Brown the meat on both sides in a frying pan over medium heat. No need to fully cook as it will cook in oven. Set aside on a plate to cool while you get the pastry ready. Lay the pastry out on work surface. Whisk egg in small dish and brush the surface of the pastry with mixed egg. Using a mini star cookie cutter, cut out 36 star shapes from the pastry. Place the meat onto a baking sheet and cover each one with a star of pastry and secure with a toothpick. Bake in a 400 degree oven for 15 minutes.